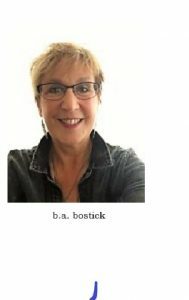 b.a.bostick has always been a great fan of Urban and Paranormal fantasy. She has put her own imagination to work on short stories, novellas and the first book of her trilogy, Raptor. My overactive imagination needs an outlet. I never wanted to write "The Great American Novel". I write with the goal of to entertaining both myself and hopefully other people. I believe Lewis Carroll who wrote: "Imagination is the only weapon in the war against reality." I don't outline or do sketches. Something triggers an idea for a story and I just go for it. I'm never sure where the characters and plot are going when I start, but my characters quickly take over and show me where they want to go. My characters are very"visible" to me. I often run dialogue in my head when I'm driving or falling asleep. That's how they talk to me. What they say to each other can sometimes take the plot in a whole new direction. Just go for it. "Fix" what you wrote later. If character profiles and outlines help use that. But write! There is no right way, regardless of all the how-to books that tell you there is. So don't get caught up in the "process" of writing, rather than the writing itself. It's extremely hard to get a traditional publisher these days. Self publishing puts a lot more work on the writer to promote a book, but e-publishers provide a lot of tools for the self-publisher. If you take advantage of self-promotion you have a chance of catching the readers attention. The ratio of print books sold to e-books is in the e-book's favor. E-books are cheaper and reading devices are light and easy to use. Instant download, instant gratification. I love bookstores, and I own a lot of traditional books, but I favor reading the electronic version. What genres do you write? : Urban Fantasy, Paranormal, YA.